Here are some suggestions for how to get the benefits of fruit with less of a sugar hit. 1. Peel dark-skinned fruit and eat just the peel. I do this sometimes, especially with black grapes, since the longevity-enhancing resveratrol is concentrated in the bitter seeds and skin, but it doesn’t taste very good, in fact, it is terrible. If you make the peel a little thicker, it will taste better, and you’ll still get less sugar than if you ate the whole thing. 2. Eat only very tart fruits. You can make them as sweet as you like with sugar substitutes. Cranberries are wonderful made into sugar-free cranberry sauce or dried to use like raisins. All kinds of wonderful things can be made with lemons and limes, which have almost no sugar. Gooseberries also have very little sugar and they are becoming more available. I was thrilled to find some at a local market recently. I used them to make a delicious sauce for lamb and a topping for ice cream. Fresh currents are similar and they are also becoming easier to find. I think you can also grow gooseberries and currents in the US now; they were banned in the past because they carried a disease that could infect other crops. 3. Eat low-sugar fruits that are usually considered vegetables. Avocados, for example, can be added to smoothies or made into mousses or frozen desserts. I’ve also seen tomatoes served in tarts and pies and there is a classic dessert from the Alsace region of France made of stuffed tomatoes. Some creative chefs are even using black olives in desserts. And don’t forget how well zucchini pairs with chocolate for cakes and muffins (yes, zucchini is a fruit). Pumpkin is perhaps the most popular in the “vegetable-as-dessert” category. It has only 4 net carbs per ½ cup serving. It can be used to make pies, puddings, breads, and muffins. Pumpkin tamales, fritters, and hush puppies are among my favorite dessert recipes from Carb Wars. 4. Conversely, eat vegetables that can be used as fruits. Rhubarb and fennel have carb counts similar to celery, but they make wonderful sweet treats. Carrots, of course are traditionally used for cakes and muffins, but they are a bit higher in sugar.5. Eat small fruits. Scientists have been tirelessly breeding fruit to be bigger, sweeter, and easier to harvest and ship. Most of what we find on the produce aisles in today’s stores would be unrecognizable to our great grandparents. Lemons are as big as oranges and oranges are as big as grapefruits once were. Choose the smallest fruits you can find; they will have more of the nutrient-rich outside in proportion to the sugar-rich inside. Tiny strawberries are certainly a better choice than the big ones with white shoulders and hollow cores. Best of all, eat wild fruits if you can. They will probably be smaller, seedier, and less sweet than the varieties cultivated for the modern consumer. They will also be available for only a few short weeks while they are in season. And this brings me to the real subject of today’s post. The Pacific Coast region of the Northwest, where I live, is not a good place for farming. This is probably one reason the native Americans who lived here were still hunter-gatherers when the first Europeans arrived, long after most of the residents of the New World had turned to agriculture. The crops that thrive beyond the mountains in Eastern Washington don’t get enough heat to grow well here. Berries are the exception. They love our cool summers with long daylight hours. 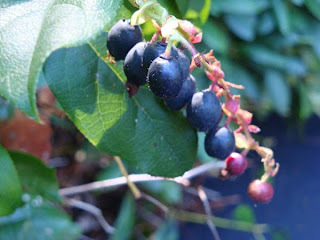 I have more than six kinds of edible, wild berries growing in the woods around my house, and these are just the ones I know are safe to eat. The pictures above were taken in my front yard. The berries on the left are red huckleberries. We also have tiny, black, evergreen huckleberries, several kinds of raspberries and blackberries, thimble berries that fit over the end of your finger (like a thimble), and salmon berries, so called because each berry looks like a clutch of golden salmon eggs. The dark berries pictured above on the top right are from the salal plants that grow like weeds here. You have probably seen salal leaves because they are widely used as long-lasting greenery in floral arrangements. Most people don’t know the berries are edible, but they are mildly sweet, tasty, and virtually seedless. I have no way of knowing the nutrition counts for them, but they are tiny and tedious to pick and the season is short so I am not in danger of eating too many. I pull off a few each day when they are ripe and eat them on my way out to the mailbox.If you do a little research, you may find edible fruits that grow wild in your area. 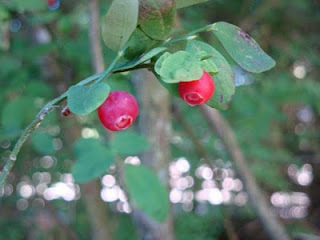 Even if you live in the city, you may discover a few berries in a park or along a walkway that are free for the taking. Note: Read up on them to be sure they are safe and don’t collect anything that may have been treated with chemicals or anything that grows beside a busy road where it may have accumulated high levels of lead from car exhausts. I’d love to hear from you about what you have eaten that grows wild where you live. Fruits vs vegetables, Tips for eating fruit. Bookmark. Good point about the skin to flesh ratio being better in smaller fruit. My glucometer tells me I can eat about 3 – 4 small strawberries, about half a dozen black cherries or a small number of blueberries (which I embed in creamed goat cheese on top of an oatcake (5g carbs)) without coming to harm. It also tells me that grapes are really good when matured – into a bottle, otherwise they are significantly nasty, and that I should avoid citrus and more than half an apple. Yes it's a case of ensuring the flavonoids outrun the sugar content. Much easier to achieve with vegetables though. Ah! my avocado is ripe, where are my prawns?